Food For Thought Cafe is one of those places that immediately come to mind whenever someone asks me to recommend a place that serves decent food at affordable prices. They have recently closed down their original branch at North Bridge Road, and shifted to a much bigger location at Singapore Botanic Gardens. Well, it is probably an understatement to say that it is much bigger. The new outlet can easily accommodate more than 200 people. This is definitely great news for regulars who always frequent the cafe. Food For Thought (FFT) Cafe at Botanic Gardens is slightly different from both the North Bridge Road and 8Q SAM Queen Street outlets. They have a self-service system where you order and pay at the cashier, and the staff will serve the food to the table. We were there for brunch recently, and while it was tempting to get extra portions, we decided to order sensibly because we were heading to Brunetti for desserts. The menu has quite a fair selection of everything: from Salads ($10) like Chicken Caesar and Juicy Portobello; to Pastas ($12-17) like Lemon Butter Mushroom Linguine and Spicy Beef Linguine; to Grilled Burgers ($8-12) like the Classic Beef and Cheese Burger; to Mains ($20-23) like Baby Back Ribs and Pan-Seared Salmon; and desserts ($4-7) like Red Velvet Cake and Hazelnut & Chocolate Cake. In addition to the ala carte menu, they also have a brunch menu and it’s easy to see why it is so popular. The brunch is just $8 for any three items and you can choose from items like Grilled Mushrooms, Hash Brown, Scrambled Eggs, Bacon, and Sausage. The food that we had in general was decent, nothing to write home about. I enjoyed the Creamy Pulled Pork Linguine ($16), while the Grilled Basil Pesto Chicken Burger ($9) and Eggs with mushroom & sausages ($8 for any three items) were okay. The highlight was definitely the Dark Chocolate & Raspberries Pancakes ($12). In fact, I’ll go so far as to say that they have one of the best pancakes in Singapore. Some of the other pancakes on the menu (from $8-13) include: Mixed Berries, Banana & Walnut, Hazelnut Chocolate and Granola. 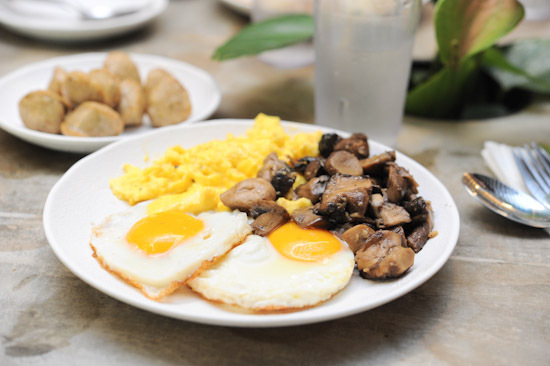 Food For Thought at Singapore Botanic Gardens is an ideal place for weekend brunch; you can take a nice stroll in the park after having scrambled eggs and sausages, with a cup of coffee. Moreover, most of the dishes are priced very reasonably. I am sure the new outlet will become very popular in no time. not worth it at all. A real good pancake is when it has the griddle taste like Chinese food wok hey. The pancake cooked in states are a bit more brown due to on grill longer. So far no matter what is put in pancakes it taste better if cooked bit longer for that certain taste. The pancake really looks yummy! I should really try it out soon.. I brought my fur kids and some friends who were visiting to the Singapore Botanic Gardens over the weekend and tried out Casa Verde which is situated beside the Visitors Centre. Given your recommendation, we just checked out FFT this weekend and it truly was an excellent experience. The price was reasonable and the food was great. I had the roast beef salad which was perfectly balanced by the balsamic dressing. My husband had the pancakes and the brunch meal which both looked and tasted fantastic, according to him. As an American, good pancakes mean a great deal to him and he has quite the discerning palate! It really doesn’t worth a visit, you wait ages to find the table you want you have to queue for food, then wait ages for actually getting it. And nothing special really. Worst service ever, location is awful between a parking and a basement, noisy, dirty and it smells like a canteen or a food court. Wouldn’t recommend it for anyone. I quite liked the place when I first started going there. But, the last few times I went the air-con was shut off and down in the basement it is just too humid to be comfortable with fans. Today’s visit was the worst though, and probably why I will never go back. Not only was the air-con off again, but they were holding a seminar in personal wealth management at one side of the venue. The presenter was amplified over the central sound system making it impossible to hear my wife at a table all the way on the other side. As others have mentioned, the service is poor (several servers with no English ability), its crowded, hot, and although cheap, the food really isnt great. Nice and spacious. However, we are quite disappointed with the food. Ordered a medium rare steak but seems totally rare in the middle. Sent back to cook further but the results is the same. It was difficult to cut through the tendon. Also ordered the linguine pasta from kids menu. Our 4 year old found it spicy!! Realized that they put substantial amount of garlic into it. *Shake head. Lastly, my grilled barramundi’s skin is too tough due to over frying. The vegetables are too salty! Guess you can come to relax and have a drink but definitely can skip the meals if u have alternate choice.